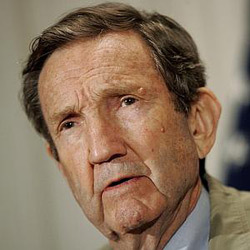 William Ramsey Clark is an American lawyer, activist and former public official. He worked for the U.S. Department of Justice, which included service as United States Attorney General from 1967 to 1969, under President Lyndon B. Johnson. He supervised the drafting and played an important role in the passage of the Voting Rights Act of 1965 and Civil Rights Act of 1968. Since leaving public office Clark has led many left-wing activism campaigns, including opposition to the War on Terror, and he has offered legal defense to controversial figures such as Lyndon LaRouche, Slobodan Milo�ević and Saddam Hussein.